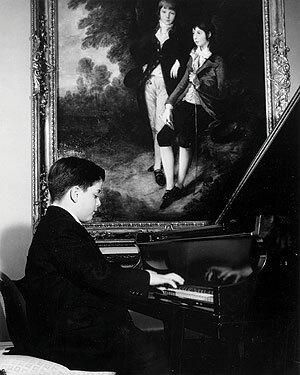 A young James Levine playing piano. Photo courtesy James Levine. Over 40 years with the Metropolitan Opera—since his June 5, 1971, debut with Tosca—Music Director James Levine has developed a relationship with that company that is unparalleled in its history and unique in the musical world today. He conducted the first-ever Met performances of Mozart’s Idomeneo and La Clemenza di Tito, Gershwin’s Porgy and Bess, Stravinsky’s Oedipus Rex, Verdi’s I Vespri Siciliani, I Lombardi and Stiffelio, Weill’s Rise and Fall of the City of Mahagonny, Schoenberg’s Erwartung and Moses und Aron, Berg’s Lulu, Rossini’s La Cenerentola, and Berlioz’s Benvenuto Cellini, as well as the world premieres of John Corigliano’s The Ghosts of Versailles and John Harbison’s The Great Gatsby; all told, he has led nearly 2500 performances of 85 different operas there. In the 2010–11 season, he conducts eight operas with the company, including the new production premiere of Das Rheingold on Opening Night; the new production of Die Walküre; revivals of Don Pasquale, Simon Boccanegra and Wozzeck; three performances of The Bartered Bride at Juilliard’s Peter Jay Sharp Theater (with the Juilliard Orchestra and members of the Met’s Lindemann Young Artist Development Program); and a June tour to Japan with Don Carlo and La Bohème (where he will celebrate the 40th anniversary of his debut on June 5 with Don Carlo in Nagoya). Maestro Levine inaugurated the Metropolitan Opera Presents television series for PBS in 1977, founded the Met’s Lindemann Young Artist Development Program (LYADP) in 1980, returned Wagner’s complete Der Ring des Nibelungen to the repertoire in 1989 (in the first integral cycles in 50 years at the Met), and reinstated recitals and concerts with Met artists at the opera house—a former Metropolitan tradition. Expanding on that tradition, he and the MET Orchestra began touring in concert in 1991, and since then have performed around the world including at Expo ’92 in Seville, in Japan, on tours across the United States and Europe, and each year during and after the opera season on its own subscription series at Carnegie Hall; this season his concerts there feature soprano Natalie Dessay, mezzo-soprano Michelle DeYoung, tenor Simon O’Neill, and pianist Evgeny Kissin. Since 1998, Maestro Levine and the MET Chamber Ensemble have performed annually at Carnegie’s Weill and Zankel halls. Maestro Levine’s seventh, and final, season as Music Director of the Boston Symphony Orchestra began with an all-Wagner program with Bryn Terfel in October and included the first BSO performances of John Harbison’s Second Symphony (as part of a two-season cycle of all five Harbison symphonies as well as the world premiere of a newly commissioned Sixth), and Mahler’s Second and Fifth symphonies for the 150th anniversary of his birth in 1860 and the 100th of his death in 1911. In addition to his responsibilities at the Met and the BSO, Mr. Levine is a distinguished pianist and an active and avid recital collaborator, especially in Lieder and song repertoire. He began accompanying such artists as Jennie Tourel, Hans Hotter and Eleanor Steber more than 40 years ago, and since that time has given recitals with most of the great singers of our time. From 1973 to 1993, Levine was Music Director of the Ravinia Festival, summer home to the Chicago Symphony Orchestra, where in a dozen programs each season he led an immense repertoire of symphonic masterpieces, operas, major works for chorus and orchestra, works for unusual combinations of instruments, one-composer marathons, oratorios, concerti, and performed as piano soloist in concerti, chamber music and song recitals. Outside the United States, his activities have been characterized by his intensive and enduring relationships with Europe’s most distinguished musical organizations: the Salzburg (1975–93) and Bayreuth (1982–98) festivals, the Vienna Philharmonic, and the Berlin Philharmonic. He was Chief Conductor from 1999 to 2004 of the Munich Philharmonic and has conducted every major orchestra in America and Europe. He makes his debut in May 2011 with the Staatskapelle Berlin and Mahler’s Sixth Symphony in the German capital. 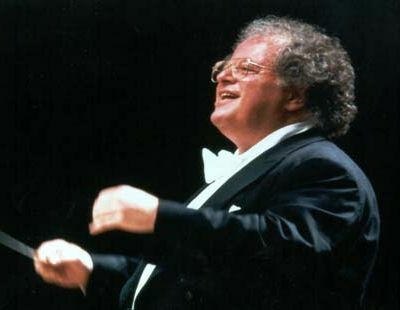 James Levine was the first recipient, in 1980, of the annual Manhattan Cultural Award and was presented with the Smetana Medal by the Czechoslovak government in 1986, following performances of the Czech composer’s Má vlast in Vienna. He was the subject of a Time cover story in 1983, was named “Musician of the Year” by Musical America in 1984, and has been featured in a PBS American Masters documentary. Maestro Levine holds honorary doctorates from the University of Cincinnati, the New England Conservatory of Music, Northwestern University, the State University of New York, and the Juilliard School, and is the recipient in recent years of the Award for Distinguished Achievement in the Arts from New York’s Third Street Music School Settlement; the Gold Medal for Service to Humanity from the National Institute of Social Sciences; the Lotus Award (“for inspiration to young musicians”) from Young Concert Artists; the Anton Seidl Award from the Wagner Society of New York; the Goldenes Ehrenzeichen from the cities of Vienna and Salzburg; the Crystal Award from the World Economic Forum in Davos, Switzerland; the Centennial Medal from the Juilliard School; the 2005 Award for Distinguished Service to the Arts from the American Academy of Arts and Letters; the 2006 Opera News Award; the first-ever Opera Award from the National Endowment for the Arts (2008); and the National Medal of Arts (1997) and Kennedy Center Honors (2003).